Sporting Goods typically require prototypes with a combination of both rigid and flexible materials integrated into one part. For example, to best simulate the desired end-product, shoe soles require various levels of flexibility (different shore levels), as well as rigid materials and even a combination of opaque and transparent elements. 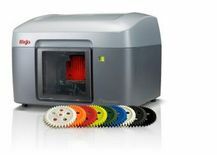 For this reason, Stratasys & Objet's inkjet-based 3D printing technology and the Objet Connex multi-material 3D printing systems are ideal for Sporting Goods prototyping. With the latter, the user can actually select the desired Shore level so as to fit the exact design requirements. By selecting the suitable Objet Digital Material, such as the ABS-like Digital Material, the 3D printed prototype can be used for more advanced testing, not only in fit and form testing, but also in preliminary function testing.